ALIPAC UPDATE NOV 14, 201: 16 pro-Amnessty GOP lawmakers lost their races now that Arizona Senate Candidate Rep. Marth McSally lost her race in the late count. Americans for Legal Immigration PAC (ALIPAC.us) has been warning GOP lawmakers and candidates that the blue wave of Republican losses in 2018 has been fueled by Silicon Valley censorship, illegal non-citizen voters, and Republican efforts to pass Amnesty for illegal, aliens which now appear to be proven by the election results. There are many conservative base voters who refuse to vote for Republicans who support Amnesty like those on ALIPAC's Cantor and Kate's Lists. 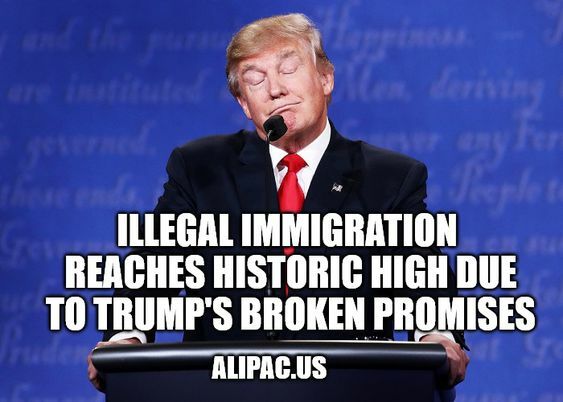 ALIPAC predicted there would be a pullback among 10-25% of the conservative base in reaction to Trump's continuation of DACA Amnesty, the lack of border wall progress, and GOP efforts to pass Trump endorsed Amnesty bills in 2017 and 2018. This prediction has been validated by the drop of GOP voter turnout from 37% in 2014 midterms to only 32% in the 2018 midterms. While acknowledging that many GOP incumbents lost in swing districts more heavily populated by Democrats and immigrant voters, the lesson learned is that Republicans supporting Amnesty for illegals will not garner support from Democrats or swing voters. 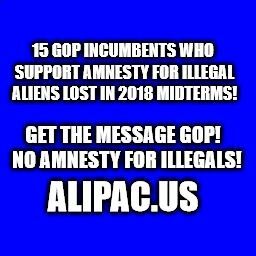 While three GOP incumbents who opposed Amnesty for illegal aliens lost their seats (Rohrabacher R-CA, Brat R-VA, Donnelly (R-CA), 14 Pro-Amnesty Republicans targeted by ALIPAC's Cantor List (View) and Kate's List (View) were defeated by Democrats in the 2018 midterms! ALIPAC's Cantor List was created in 2015 to inform GOP voters which federal Republican lawmakers shared the goal of Democrats and illegal aliens to institute Amnesty. Kate's List, named after illegal alien crime victim Kate Steinle, was created by ALIPAC in 2017 after 34 GOP lawmakers signed a letter to Speaker Paul Ryan (R-WI) asking him to pass Amnesty for DACA recipients before Christmas 2017 instead of focusing on protecting Americans like Kate Steinle and thousands of others harmed by illegals each year! "These historic election losses should send a clear message to all GOP lawmakers including President Trump that trying to pass Amnesty deal legislation for illegal aliens is a campaign killer for Republicans," declared William Gheen, President of ALIPAC. "We have accurately warned these lawmakers that their efforts to pass Amnesty legislation, like this year's Goodlatte compromise bill and prior bills from the Gang of Eight, have demoralized many GOP voters who see these efforts to pass Amnesty as a betrayal. Now the election results confirm our warnings as fact." President Trump apparently does not realize how self destructive and damaging Amnesty legislation deals are since he indicated he was open to cutting a "deal on DACA" with Democrats in the aftermath of the 2018 midterms where Democrats took control of the US House. Gang of Eight GOP Senator Dean Heller (R-NV) was one of 14 GOP Senators who voted yes on the Gang of Eight Immigration Reform Amnesty for illegal aliens bill in the US Senate in 2013! Of special note, many of these Republican incumbents who support Amnesty legislation have strong A and B grades from immigration watchdog NumbersUSA which once opposed Amnesty deals but started backing Amnesty deals for illegal aliens in the last 24 months since Trump was elected. ALIPAC activists will now work to convey this message to the remaining GOP lawmakers and President Trump before they try to pass Amnesty legislation during the lame duck session before Christmas of 2018. GOP lawmakers who side with Democrats on Amnesty often try to pass Amnesty bills over the holidays when they think the American public is less engaged. ALIPAC activists have successfully fought and stopped Amnesty legislation in Washington, DC, more than seven times since the group was founded in 2004. Last edited by ALIPAC; 11-14-2018 at 02:56 PM. Last edited by imblest; 11-08-2018 at 01:47 PM. There are many conservative base voters who refuse to vote for Republicans who support Amnesty like those on ALIPAC's Cantor and Kate's Lists. This is so true, and it isn't just about the Amnesty, but the entire picture. I'll borrow from Ann Coulter here.....Republicans control the state legislature and governor’s office in Florida. They control the U.S. Congress and the presidency. If that’s not enough to prevent two statewide Florida elections from being stolen, the GOP is more useless than I’d already imagined. We vote for the "lesser of 2 evils". Hillary Clinton IS the most corrupt, evil person on the planet. We have no choice. We are damned if we do and damned if we don't. That is a fact for the last 4 decades in our elections! NO OUT OF STATE DONATIONS TO ANOTHER STATE'S CANDIDATE, THEY ARE NOT A RESIDENT. WE NEED A LEVEL PLAYING FIELD BECAUSE WE ARE GETTING SACKED! Memo From Middle America: Good Riddance To RINO Steve Russell, OK-5, Done In By Demographics, Arrogance, And Fanatical Immigration Enthusiasm.